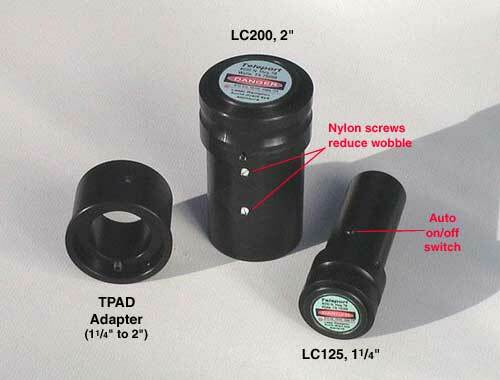 NOTE: The LC125 and LC200 collimators are no longer available. A laser collimator uses the principle of auto-collimation. From the center of the focuser, it sends a beam to the diagonal, on to the primary, back to the diagonal, then back to the focuser. When collimated, the beam hits the center of both mirrors and returns directly to its source. Proper collimation of a Newtonian telescope is extremely important for high quality images. When collimated, the image formed on the axis of the primary mirror is in the center of the focuser. The Teleport laser collimator helps achieve that quickly by helping you adjust the angles of first the secondary then the primary mirror. The collimator is inserted into the focuser, which switches it on to project a laser beam into the optical path. The laser beam reflects off the secondary mirror and then down to the primary mirror. 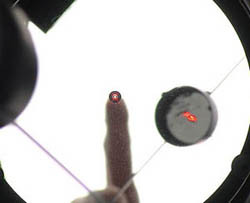 The secondary is adjusted so the beam hits inside the ring on the center of the primary, shown here at the image of my fingertip. 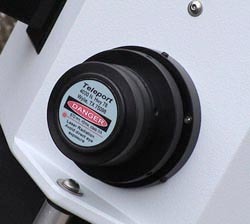 An adhesive ring is included with each Teleport collimator. The beam reflects from the primary back to the secondary, and from there to the face of the collimator. The pimary is then adjusted to center the spot, which falls back into the source hole and disappears when collimation is achieved. 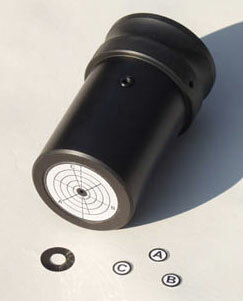 Teleport collimators have a unique three-line and ring target face where the spot returns, and now also include labels for the three primary collimation bolts. These correspond to the letters on the target face and remind you which bolt to turn which way to center the spot. This reduces the trial and error typical with other laser collimators.